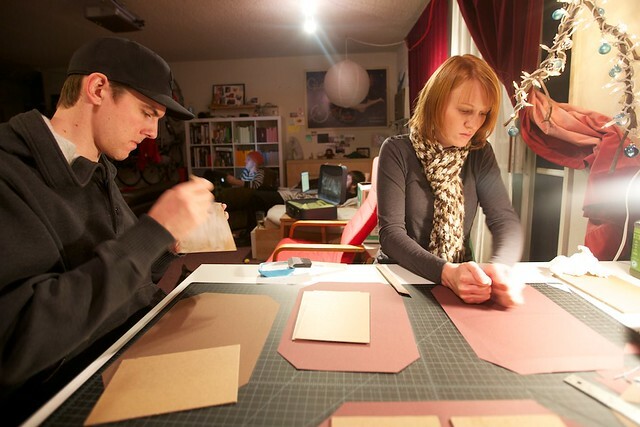 One of the biggest projects I undertook for our wedding was making the invitations. I had a crazy idea that this would somehow be simple, despite a multi-step binding process, even though I’d never actually bound a book before. I just knew I could do it. I had no idea what I was getting myself into. 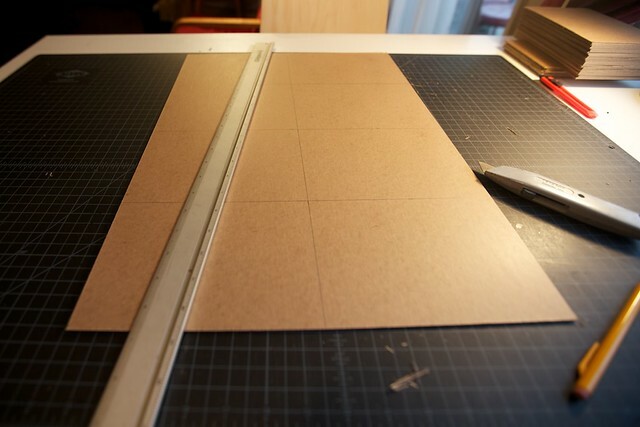 Every book started as a sheet of board precisely measured and cut. 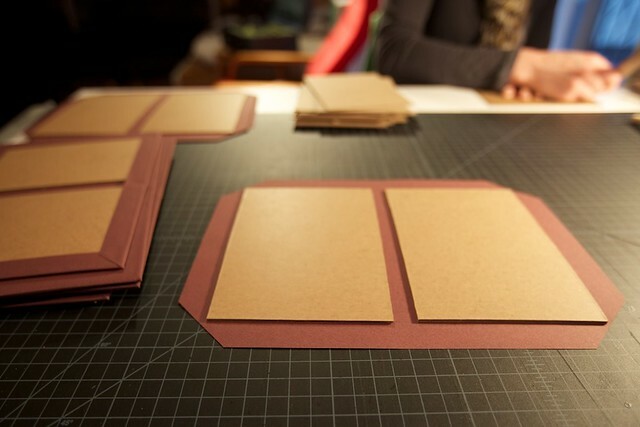 Then each piece was placed and glued to an assortment of colored papers. At this point I got some help from my friend’s Jannatha and Kyle. 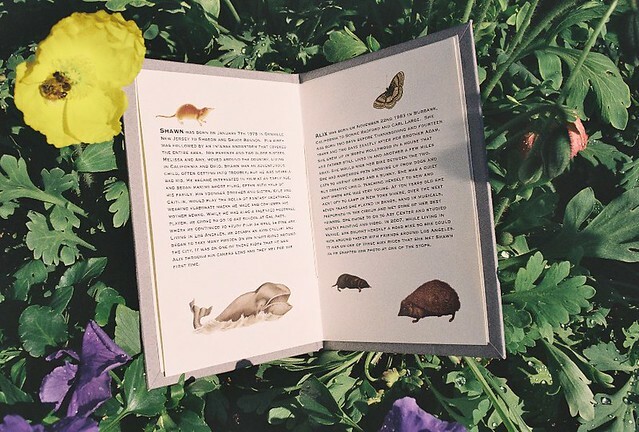 For the inside pages, Shawn and I bought a few vintage book plates with images of animals, which we scanned and laid out in our book. We chose a lot of owls and birds. 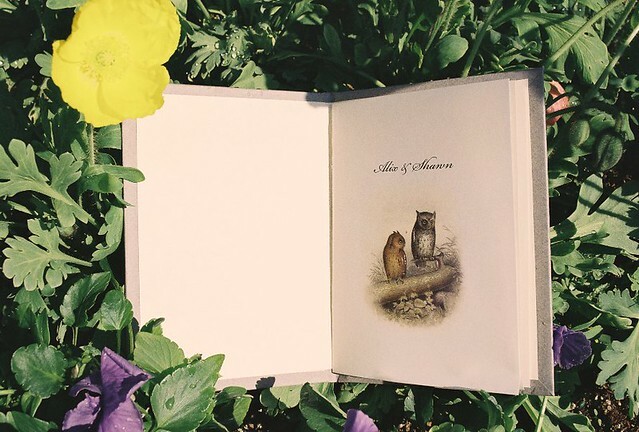 I wrote small stories about us and wove it into the information about the actual wedding. 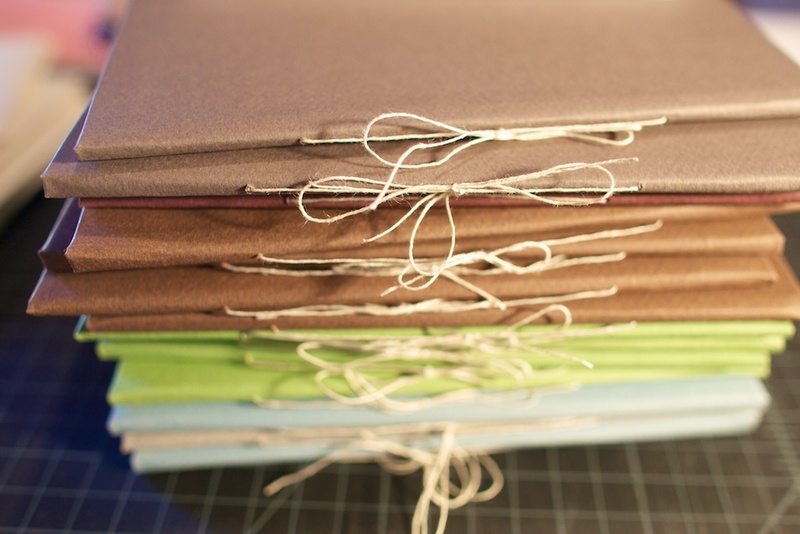 We had them printed at a local print shop and then I sewed the insides into the books. 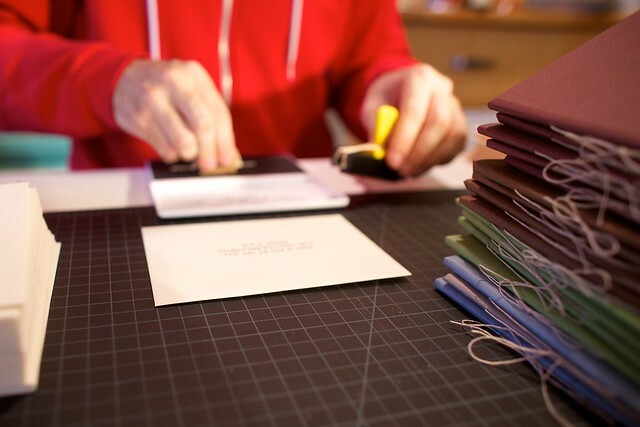 Shawn helped me stamp return envelopes for our reply cards. We were able to use the same envelopes from our save the dates. I made about 90 of these books. All told it was probably 60 hours of work, but then again I wasn’t exactly keeping track. Are you ready to see inside? While it was quite a long and arduous process, the responses that we received from guests made it all worth it. That being said, I would never do anything like it on that scale again. I wouldn’t have been able to complete them all in time without help from my friends, Shawn and my mom who helped me stamp and seal all the envelopes. p.s. Of course I left out a few pages, so you all don’t show up at the wedding, since it hasn’t happened yet, but I’ll be sure to show them off in the end. true! but i hope we won’t disappoint. would love to see your invites! They’re lovely! That picture of Mochi “helping” you is the best. 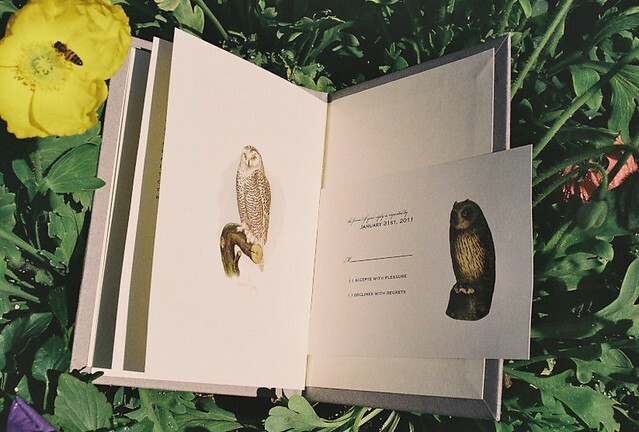 These are easily the most spectacular invitations known to human kind. I’m definitely keeping mine! Wow. Congratulations on completing them all! You really should submit the pictures to Offbeat Bride. These are soo creative and lovely. These are so amazing, I love them!! coming from the woman with the most crazy awesome invitations possibly ever that’s a major compliment. I had thought they were handmade when I saw it, but couldn’t actually believe it, given how a) beautiful, b) complicated, and c) perfect they are. I never should have doubted it. Love the invite! It looks so dainty and darling! hi there! love these and am trying to figure out how to do something similar. where did you get your supplies and do you have info on the measurements of what you used (specifically the paper and the boards)? any info you wouldnt mind sharing with me by email would be truly amazing! congrats on your wedding and marriage! I don’t have specific measurements anymore but I can try to give you an idea. 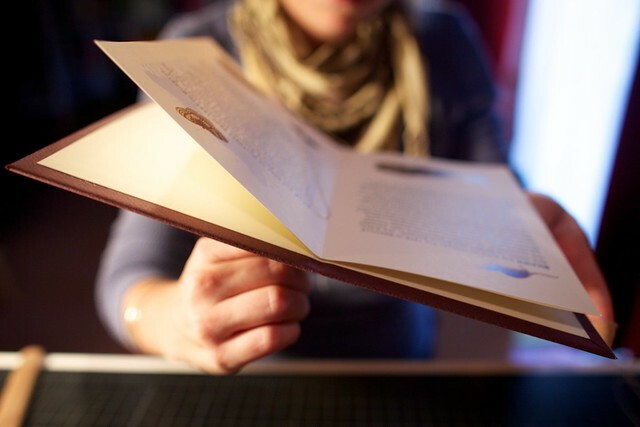 The inside pages were 8.5″ x 11″ folded in half so that we wouldn’t have to trim the pages at all. The boards were then about 1/2″ wider than the folded paper and the outside paper was about 1.5″ larger on all sides if I’m remembering correctly. We purchased nearly all the supplies at an art supply store nearby and a few odds and ends at an office supply place. Pretty simple. Sorry my instructions aren’t too clear, but I just really made it all up as I went along. 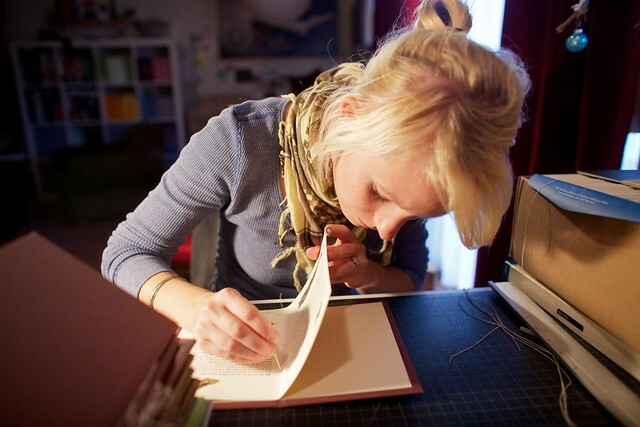 In sure there are much better resources for book binding out there that can help you. Can you tell me what type board,paper and twine you used? Also, what the name of the stores you purchased from. I making similar invites and I’m price comparing. Book binding supplies are a bit pricy so any help would be appreciated. If memory serves me correctly I was able to get most of my supplies at Blick/The Art Store. I don’t recall what the brands were though. Oh, no. 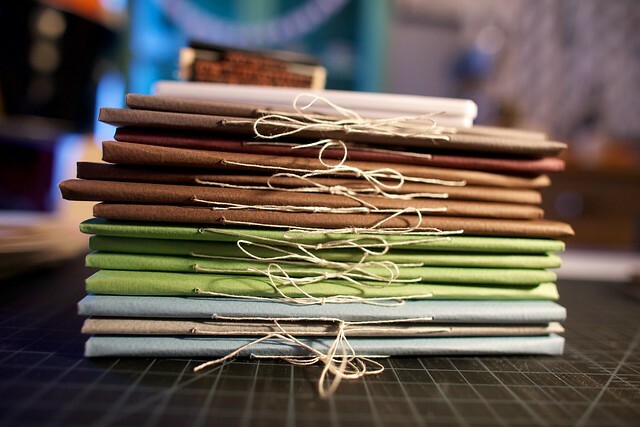 I love these, they are wonderful, but now I have to either resist temptation or start to work on creating and binding 100 books!! We are raising money for teens in Kenya to design and build chicken coops for their community, so the book would be the prefect way to provide some info on the project in a cool way. Are there more pages you could share now?